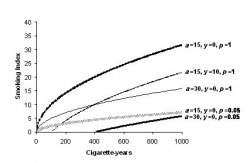 where nk (k = 1, 2, …, K) cigarettes per day (intensity) are smoked for xk years (duration). This is more exact than pack-years generally used for smoking. S1 suffers from the same demerit as the pack-years, namely that smoking 10 cigarettes a day for 25 years is the same as smoking 25 cigarettes per day for 10 years. This obviously is not always true. For lung cancer, duration may be more important whereas for coronary disease intensity of smoking may be more important. Despite this deficiency, pack-years continues to be the most accepted measure so should S1. S2 = Skpknkxk (pk = 1 for regular cigarette). where y is the number of years lapsed since quitting. S = (3 – a/15)(½– y); a = 30 for a ³ 30. A value less than zero is interpreted as zero. This is a comprehensive index of the present burden of smoking as it incorporates (a) the duration of smoking, (b) the quantity of smoking, (c) smoking of filter cigarettes and other forms of tobacco consumption that can be factored to cigarette smoking, (d) progressively less burden from smoking additional pack-years in life, (e) benefit of the time elapsed since quitting, and (f) deleterious effect of starting smoking early in life. The index has in-built feature to consider current smokers and ex-smokers and obviates the need to divide ever smokers into such dichotomy. The index models the entire history of smoking into a single metric. The modification of the cigarette-years in some typical conditions is shown in Fig. 1. This index does incorporate a large number of aspects of smoking but fails to capture occasional smoking or the beneficial effect of interruption. The following is the smoking history of three persons. Person A: Started smoking at age 12 years. Initially smoked 10 regular cigarettes for 3½ years. Since then smoking 20 filter cigarettes a day for the last 17½ years. Person B: Started smoking at age 21 years. Smoked 12 cigarettes a day for 1 year,15 cigarettes a day for 2½ years, 20 cigarettes a day for 1½ years, no smoking for 6 months, and 2 cigars a day for 1 year. He has not smoked for the past 4 years. Person C: Never smoked but spouse smoked. When both were together an average of 5 cigarettes a day were smoked. This started at age 27 years and went on for 6 years. There is no exposure for the past 3 years. An index of 8.21 increases to 18.1 because smoking started at an early age of 12 years. Because of quitting 4 years ago, the present burden of smoking is small. The burden was small because of passive smoking and that too vanished because of no exposure for the past three years.